Big Bang Theory creator Chuck Lorre attacked White House Press Secretary Sarah Huckabee Sanders in the show's closing credits. On Thursday's episode of the CBS sitcom the 66-year-old television writer, who's known to be an outspoken Trump critic, shared a post mercilessly mocking Sanders. At the end of every Big Bang Theory episode there's a closing card with a memo which varies from thank you notes, Lorre's random thoughts, or in this instance, a bullying message. 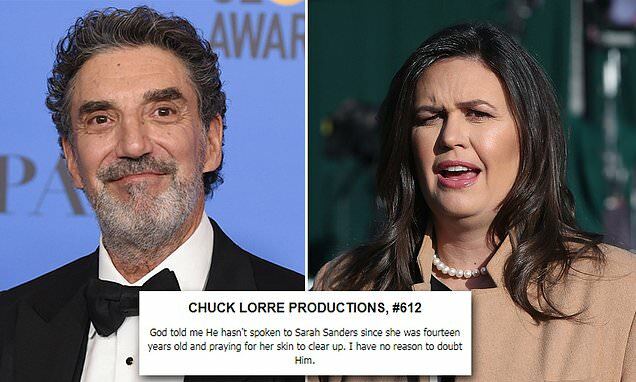 'God told me he hasn't spoken to Sarah Sanders since she was fourteen years old and praying for her skin to clear up. I have no reason to doubt Him,' the card said at the end of the February 7 episode. Lorre mocked Sanders' faith and slammed her looks with the card. Sanders has been outspoken on her Christian faith and her belief that God placed Trump in the White House. 'I think God calls all of us to fill different roles at different times, and I think that he wanted Donald Trump to become president and that’s why he’s there. And I think he has done a tremendous job in supporting a lot of the things that people of faith really care about,' she said in an interview with the Christian Broadcasting Network. 'Honestly, it’s very hard at this point to even take a lecture from Democrats on what is moral and what isn’t,' she added, according to the transcript provided to the Washington Post. The card is filed online with the rest of his vanity cards on Chuck Lorre Productions' official website. So far there are 612 cards listed, the Sanders jab being the latest one. Neither Lorre or Sanders has responded to the jab.